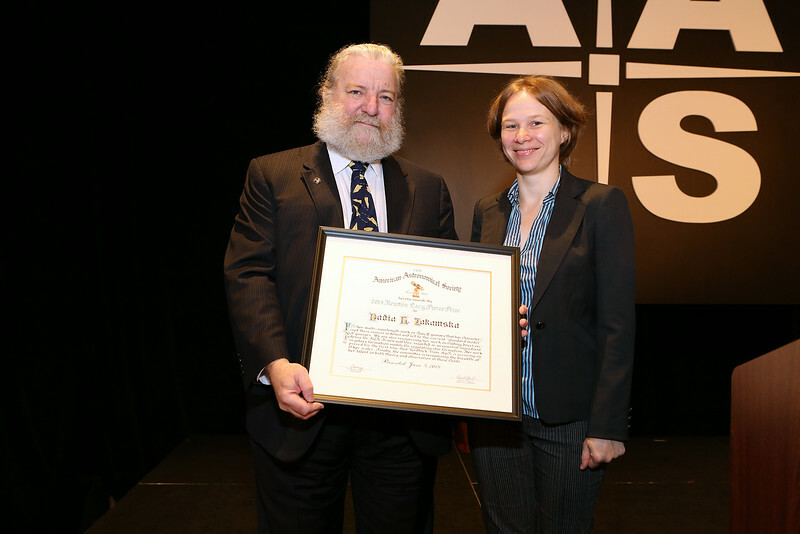 Nadia L. Zakamska (Johns Hopkins University) is the 2014 recipient of the Newton Lacy Pierce Prize for observational research by a young astronomer. As noted by AAS President David Helfand (Quest University Canada), Zakamska was cited "for her multi-wavelength work on Type II quasars, which has characterized these energetic sources in detail and led to the current 'standard model' of quasars." Zakamska, whose prize lecture was entitled "Quasars and Their Effect on Galaxy Evolution," was also cited by the Pierce Prize Committee "for her work on finding direct evidence for outflows driven by active galactic nuclei (AGN), regarded as an essential ingredient in galaxy-formation models for regulating star formation." Nadia L. Zakamska (Johns Hopkins University) is the 2014 recipient of the Newton Lacy Pierce Prize for observational research by a young astronomer. After being introduced by AAS President David Helfand (Quest University Canada), Zakamska delivered her prize lecture, "Quasars and Their Effect on Galaxy Evolution." AAS photo © 2014 Joson Images.